Why are Vinyl Gazebos Perfect for Weddings in Texas? A vinyl gazebo shares many characteristics with other vinyl products. Chief among those is strength and durability. A vinyl gazebo from Future Outdoors is much stronger than a wooden one with the same dimensions. Especially in north Texas, durability is important for outdoor structures. A gazebo will need to stand up to snow, ice, wind, hail, rain, heat, flooding, drought, and who knows what else. Fortunately, a vinyl gazebo from Future Outdoors is up to the task. Our vinyl is up to two times stronger and three times more flexible than wood. That means your vinyl gazebo will be around for many wedding seasons to come. No matter what kind of wedding venue you have, a vinyl gazebo can be the perfect addition to it. Vinyl, unlike wood, can come in a range of unique styles to suit your particular desires. Want a large gazebo at the end of the porch for some additional shade? Sure thing. Want a small, picturesque freestanding gazebo in the middle of the lawn? No problem. If you can dream it up, we can build it for you. If you build a wooden gazebo, you can expect to paint or stain it every year or two. You can also expect to regularly replace old or worn-down boards and supports. You may need to fix rotten sections of the wood. You might also have to fight off termites, carpenter ants, carpenter wasps, and other pests. In short, you’ll still be paying for a wooden gazebo years after you buy it. In contrast, a vinyl gazebo is very nearly maintenance-free. Other than a light wash with the garden hose occasionally, vinyl doesn’t need any upkeep whatsoever. It doesn’t attract pests, it doesn’t rot or warp, and it doesn’t wear out with regular use. In short, vinyl is a long-lasting solution. Along with vinyl gazebos, many weddings take place under arbors, lattices, or other outdoor structures. And along with vinyl gazebos, we can make all of these other structures from vinyl as well. Accessorize your vinyl gazebo with a lattice archway, arbor, and more. Because of their picturesque beauty and their durable utility, a vinyl gazebo is perfect for more than just wedding ceremonies. We’ve had customers use their vinyl gazebos to host anniversary parties, family reunions, quinceañeras, and outdoor events of all types and sizes. No matter what you use your venue for, a vinyl gazebo can be the perfect addition. Want to learn more about installing a vinyl gazebo on your property? Call Future Outdoors today! We’re the vinyl experts in the Dallas area, and we’d love to help you decide what kind of vinyl gazebo is right for you. 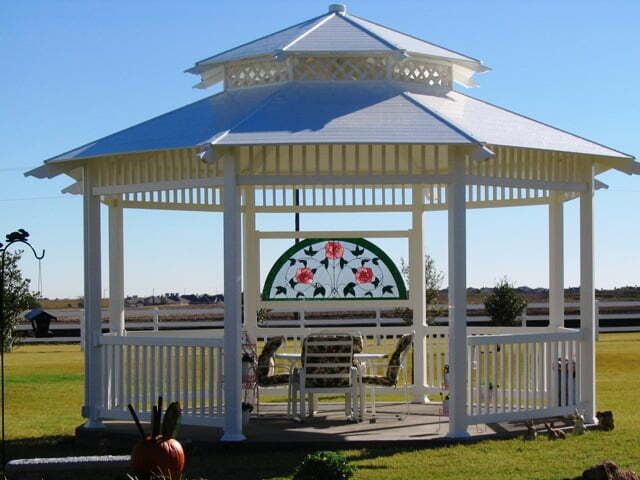 GIve us a call at 972-576-1600 and tell us what kind of vinyl gazebo you’re dreaming of.